Random House Books for Young Readers, 9780593122068, 18pp. 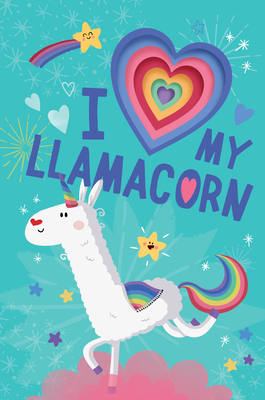 The cutest half-unicorn half-llama you can possibly imagine comes to life in this rainbow-colored confection of a board book! Do you love llamas? How about unicorns? Now imagine if you smushed them together and added a zillion rainbows, glitter, and some magic! You'd get a whole new best friend in the shape of...a LLAMACORN! Llamacorns are fleecy, sparkly creatures that are full of love and kindness, and can make all your dreams come true. In this rhyming board book, a die-cut heart shines a new color of the rainbow on every page! Kids and adults will giggle and swoon over this fantastical creature, deliciously rendered in bold jewel tones. DANIELLE MCLEAN is a children's book editor who lives in South London, England. When she's not writing and editing children's books, she'll be found in a ballet class pursuing her other childhood dream. PRISCA LE TANDE is a child of the disco era--so dancing queens and grooving cats are right up her street. She sees the world of illustration as a dessert trolley laden with your favorite things. Why not taste everything; you can always go to the dentist afterwards. After studying Applied Art at school, she enrolled in a film studies degree and embarked on an adventure into the world of animation. She is still living the adventure, as the author and artistic director of the animated series "Grosha and Mr B." When she was young, Prisca adored the craft craze, Scoubidou. It's that same simple creativity that gives her such joy now that she's creating books for children.